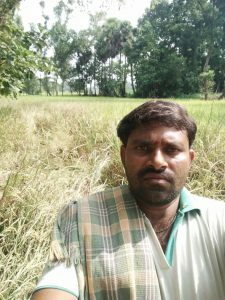 From Srikakulam, Andhra Pradesh, Peter Bakos shares this note about K Varahala Nadu, farmer and core member of AID-Srikakulam, who, like many farmers, is facing the brunt of climate change. In a perpetual plight to provide us with nutrition and our sustenance, it is the farmer who has to bear the burden. In a time not so distant past, the farmer was able to plan for the cropping season. The weather gave recognizable indicators at timely intervals. Not even the most highly sophisticated monitoring technology can come close to predicting what farmers have always intuitively known. Now due to climate change nature is in an upheaval. Farmers are now at the mercy of those who claim they know a solution. A farmer’s land and crop is their sole survival. When that is at risk, they have to try all avenues to try and regain a footing in their own land which has now become foreign to them. KV Naidu, farmer and motivator in Srikakulam District. Meet Kintaly Varahala Naidu, core team leader of AID-Srikakulam chapter, a dedicated motivator for over 10 years. He lives in Appalagraharam and has been instrumental in all of AID-Srikakulam’s village outreach programs, covering more than 40 villages in 3 mandals of Srikakulam district. K.V.Naidu as he is warmly known in the community has been reaching out to farmers and landowners throughout the district, guiding them on SRI techniques, desi seeds, organic and natural farming concepts. 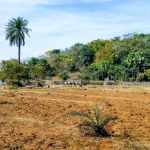 He has himself over the years been experimenting and practicing the techniques on his own 2 acres of land. 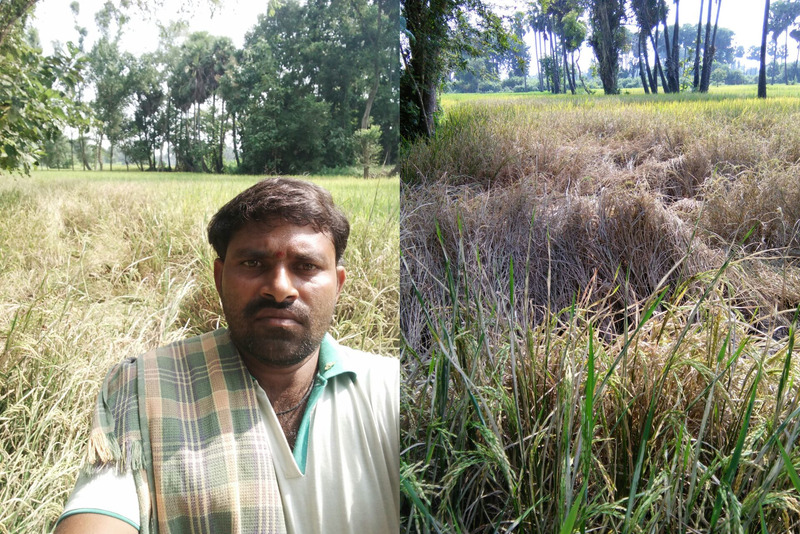 Chemical overload destroyed KV Naidu’s paddy crop. 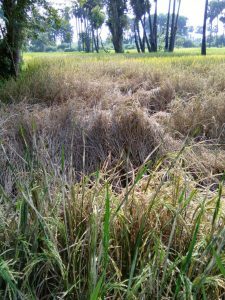 Up until this year – a year that saw an unexpected heavy downpour late in the growth cycle of the paddy crop, this brought about an unprecedented number of insects. 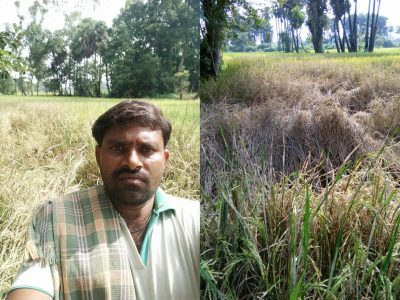 He was duped into using very expensive pesticide to control the insects, as the only option that would save his crop, but he is now not only out of pocket for the pesticide but his and his father in-laws crops have been totally devastated, a total of 5 acres of paddy crop unfit for consumption by people or beast. 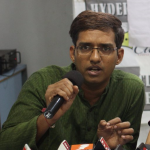 If a well-educated and broadly-versed farmer who has interacted with thousands of farmers throughout the country, attended numerous trainings and himself evolved and disseminated farming techniques, can fall prey to the “mass chemical farming promotion” propaganda that is now flooding into our rural villages,this linked with exorbitantly high interest loans (to pay for the chemicals) what chance do the average farmers have for their continued survival? AID and partners are working to raise awareness of these daily survival issues farmers face and advocating for government policies that would support farmers in pursuing agriculture that sustains them, their lands and livelihoods, and food security and natural resources for all. Let us all make a concerted effort to support our farmers – buy farm fresh, buy local, buy organic, shout from the roof tops, any way we can. Let us guide our governments to promote policies that will guide farmers to a sustainable future, so that one day they will no longer sacrifice their lives for our nourishment.